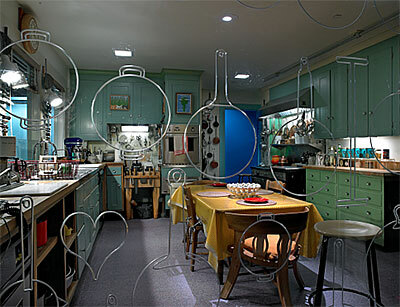 Julia Child's Kitchen: One of the Smithsonian’s most popular artifacts, the kitchen contains the tools, equipment, and furnishings arranged exactly as they were when Julia donated it to the museum. She was an important force who changed the way many Americans think about and prepare food; she inspired many cooks to venture into unfamiliar cuisines and encouraged them to enjoy cooking and to share the pleasures of the table. “New and Improved!”: Explore the innovations behind some of the major changes in food production, distribution, preparation, and consumption since the 1950s. Learn about the rise of large-scale, centralized agriculture, the expansion of manufactured “convenience” foods, and the tremendous increase in drive-thru and on-the-go dining. Resetting the Table: How have social and cultural movements affected what’s on the table in America? Explore the role of new immigrants in introducing new flavors. Learn how shifting gender roles, working patterns, and family life have changed the way we eat. Examine the roots of movements embracing local, fresh, and organic foods. Wine for the Table: The tremendous growth and expansion of wine and winemaking is an important story in postwar America. Discover how new technologies, innovators, and changing attitudes led to the production of wine in all 50 states by 2000. Open Table: Take a seat at a large, communal table and engage in conversation about a wide range of food-related issues and topics.